Some skills are perishable, which means they require you to work on them if you want to keep them strong. I’ve done a lot of training work, helping agencies and law enforcement professionals lately. I’m on the range all day doing a police rifle training. In addition, I also do some vehicle defense training. Plus, I’m working with the SWAT guys. In our conversations, we talk about perishable skills, and what skills are perishable. Some say you must repeat 3,000 times before it’s a learned behavior. That is, in order for it to become on-demand for you. Personally, I don’t believe that. Now, it doesn’t take much to keep your skills strong. You just need to understand how to do things the right way. For a moment, let’s go back to our recent women’s class. 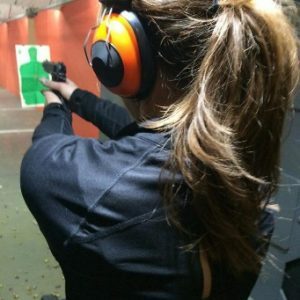 There was a woman, our student, who had zero firearms experience. Our student never shot a gun in her life. The first time she pulled the trigger was in front of Christy on the range. I know, I was there watching. Surprisingly, it was lights out from the beginning for the target. From the first shot she fired to the last, it was lights out for the target. Why? Because she learned the right way. She had no preconceived notions of things she was supposed to do. Our student did her best , with only what she was given by the Instructor. Christy gave her the actual simplistic things you need to do. All to become successful with a firearm, without a lot of fluff. And guess what? When you do that, your success is guaranteed. The point I made with my law enforcement professional and the SWAT guy friends, was that some skills are perishable. For that reason, I think the actual hard skills of hitting the target and the manipulations are those that are perishable. 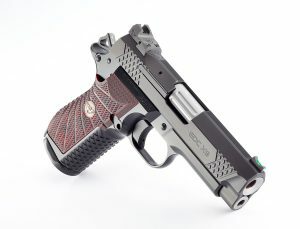 Talking about shooting, what do you actually need to do to be successful with a firearm. After all, success means hitting the target. What do you actually need to do to be successful at hitting the target? As many will tell you, it’s very simple. But of course, it’s easy for me to sit here and tell you how to do it. It’s another thing for you to actually do it. Yet if you take the concept, listen to me, then actually bring this concept to the range and do it, you will be successful. I guarantee it. If there’s a barrel and a trigger then this applies to the firearm you may be using. That concept is trigger finger management and muscle discipline. As you just discovered, that’s what it’s all about. I learned a lot from my very good friend, and most admired mentors in this industry, George Harris from Sig Sauer. According to George, trigger finger discipline and muscle management was a phrase he coined. That’s why, every time I’m teaching a firearms class or working with folks on the range, this is the meat of what I teach them. Now you can see, this is why I make sure they learn trigger finger discipline and muscle management. The next time you’re on a target and you see your sights, they must line up on whatever target you want to hit. Do you see, it doesn’t matter whether the target is 100 yards away or it’s a piece of paper that’s 10 yards away stapled to a cardboard backer? You will see your sight on the target, and you will know that the sights are lined up correctly. Besides that, you have the dot or cross hairs on your front sight where it’s supposed to be. Now, you just move the trigger without moving the sight. As you can see, this means moving the trigger without moving the muzzle. This is the key, so really think about that. For success, you need to manipulate the trigger, for accuracy and precision. At that moment, if you’re thinking about moving the trigger without moving that barrel, you will be successful. Follow these tips, and your accuracy as a shooter is guaranteed. If your sights are on the target, if they’re lined up correctly and you move the trigger and your gun doesn’t move much, you will hit the target. 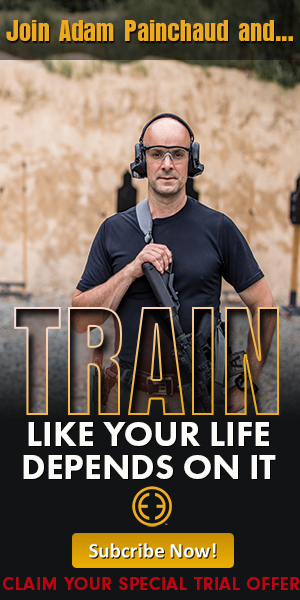 When you do practice trigger finger discipline and muscle management, your success hitting the target is guaranteed. The guys I see when giving trainings, they are proficient. I work with them on the range on a regular basis. What I see is perishable even with folks who train on a regular basis. Even if they train weekly, monthly or even quarterly. I see two things that are perishable. The first thing I see, is remembering and implementing the act of shooting correctly. That means moving the trigger without moving the sights. That is a bit perishable. And the second is, sloppy handling. That’s really perishable. I see sloppy handling. Look, your hard skills of handling is something you can practice at home without any bullets. Because, if we’re talking about a pistol, I’m talking the act of getting your pistol out of the holster. I’m talking about putting your pistol back in the holster. I’m talking about reloading from a magazine pouch, unloading, cleaning a malfunction, things like that. These are your hard skills. Remember, there are two things I see that are slacking, that are perishable. With the pistol, it’s mostly coming out of the holster and reloading that I see that are slacked up on, especially when reloading. Just as important, in order to feed that gun and do it smooth and fast. Listen, that smoothness and doing it correctly, requires skills. While at the same time, those skills are somewhat perishable. Now, you don’t need to practice every day or even every week. But at least devote some time to trigger finger discipline and muscle management regularly. Join the conversation… let us send you the latest information about the launch coming up. 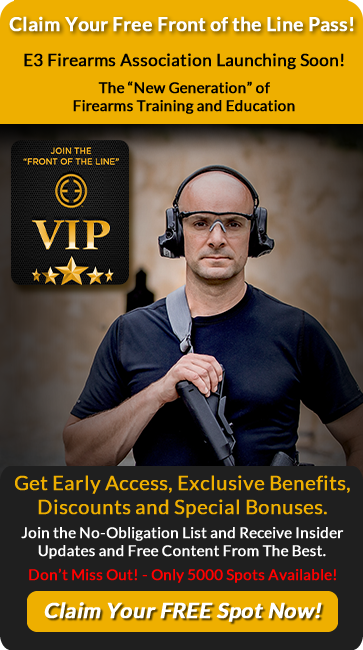 if you are on our list you will have the opportunity to be a founders member and only Founders will get special treatment and privileges no other member will get. We promise to respect your email inbox and only send you great information. We will also let you know the launch dates.